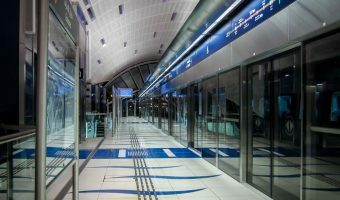 Rashidiya Metro Station is the eastern terminus of the Red Line of the Dubai Metro. It is located in the Rashidiya area of Dubai, near Dubai International Airport and just west of Mirdif. The station has a park-and-ride car park with spaces for around 2,700 vehicles. Parking is free for Dubai Metro passengers. Several feeder buses depart from Rashidiya Metro Station. Services include F03 (Mirdif – including Uptown Mirdiff), F05 (Al Mizhar), F06 (Rashidiya), and F10 (Mirdif – including Uptown Mirdiff and City Centre Mirdif, Al Warqa). The adjacent station on the Red Line is Emirates. VOX Cinemas City Centre Mirdif (1.5 miles) - 10-screen cinema at Mirdif City Centre. Map showing location of Rashidiya Metro Station. 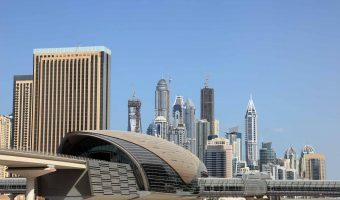 Guide to Emirates Metro Station.